MEET DAVE "BIG D" BENTLEY - A MAN OF MANY HATS I wear a lot of hats in the course of my life. I wear the "husband hat" with my wife, Andie, whom I have been married to for 26 years. I wear the "daddy hat" with my children, Danielle and David, and their spouses, Micah and Tracie. I am privileged to don my "Papa hat" with my two gorgeous grand-daughters, Amaria and Jaydan, and my energetic grandson, Jethro. I wear the "pastor hat" with my church congregation in Wallingford, Vermont. I have served churches in West Virginia, Alabama, Florida and Vermont. In December of last year my wife and I accepted the call to serve in Wallingford, Vermont. In addition to this variety of caps, I am a student, attending Liberty University to receive a Masters in Teaching in Elementary Education as well as secondary Language Arts. My hobbies tend to revolve around my family, so they include, camping, traveling, playing board games, and spending time with them. In addition I enjoy reading, rainy days, listening to and playing worship songs, and cooking. WHY IS THERE SO MUCH VIOLENCE AND HATE? · A father to the fatherless offers protection and provision. · Prisoners who have been held wrongly by strong powers. ONLY THE REBELLIOUS LIVE IN A PARCHED LAND. · A stark contrast to the promised land and eternal heaven. Dear people, please turn to God. 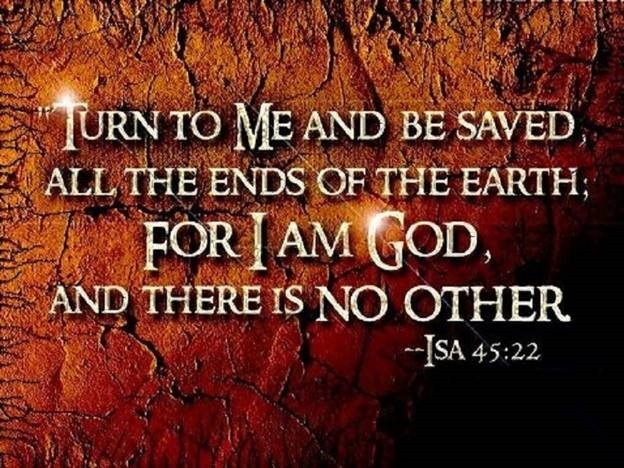 · Turn to Him for Salvation in Jesus the Messiah! · Turn to His Spirit for guidance and wisdom! · Turn to His Word for revelation and truth! · Turn to Him in prayer for daily walking with Him! · Turn to His Church for instruction and fellowship! This Sunday, find a church where you can learn about God and His plan for you. Find a church that preaches and teaches from the Bible. Find a church that calls you to prayer and leads you in worship. If you are in the area, I invite you to Wallingford Baptist Church in Wallingford, Vermont. We meet at 10:00 on Sundays. We would be happy to welcome you. 8 What does it say? ” THE WORD IS NEAR YOU, in your mouth and in your heart”– that is, the word of faith which we are preaching, 9 that if you confess with your mouth Jesus as Lord, and believe in your heart that God raised Him from the dead, you shall be saved; 10 for with the heart man believes, resulting in righteousness, and with the mouth he confesses, resulting in salvation. And in Jesus Christ his only Son, our Lord; who was conceived by the Holy Spirit, born of the Virgin Mary, suffered under Pontius Pilate, was crucified, dead, and buried; the third day he rose from the dead; he ascended into heaven, and sitteth at the right hand of God the Father Almighty; from thence he shall come to judge the quick and the dead. Creeds were originally designed to be a statement of faith for a person who was about to be baptized. Over time these baptismal creeds were incorporated into the worship service for recitation by the entire congregation as an expression of their common faith. 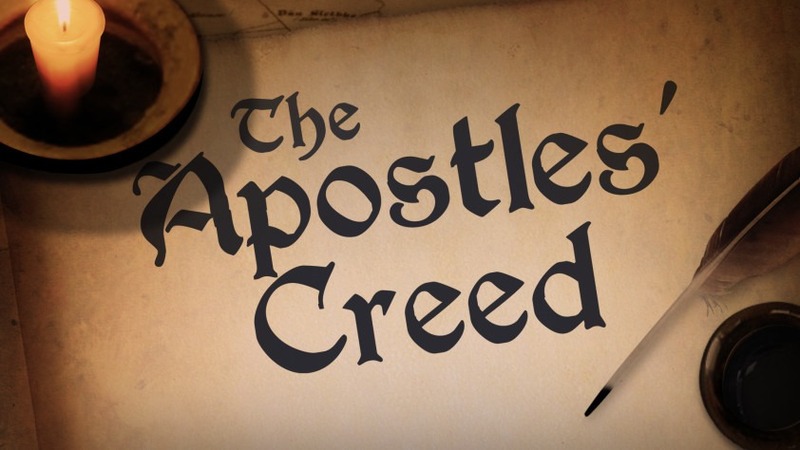 Later, creeds were used by a communion of churches to express their common understanding of the Christian faith.Because the Apostles’ Creed is a summary of Biblical truth, we should study it and be edified by the Biblical truths it contains and conveys. The Crux of the Creed – I BELIEVE! 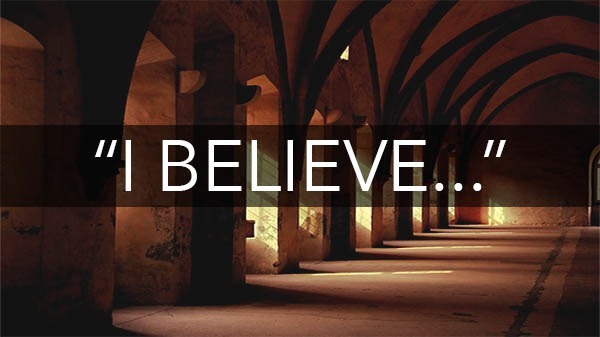 What are Some Things You Have Believed In? Many of these beliefs have let us down and fallen short in the crunch. In Reality, those beliefs don’t require much investment or commitment. What about God? Jesus? The Holy Spirit? The Church? Heaven? I cannot speak for anyone else but myself. You are the Christ, the Son of the God, THE LIVING ONE. I Demonstrate my faith in my car by turning the key. I Demonstrate my faith in a chair by sitting upon it. I Demonstrate my faith in a plane by purchasing a ticket. I Demonstrate my faith in a physician my making an appointment. A creed is a statement of personal belief. That is why it is so important that you know what it is that you are affirming. It does no good if you recite the words of the Apostles’ Creed but you don’t know what it really is that you are reciting, or worse, that what you are reciting is not an affirmation of what you truly believe. A mid-western church rented a theater to watch The Passion of the Christ on opening weekend. Afterwards they gathered for dinner, discussion, and prayer. The pastor later returned home in a somber and contemplative mood, deeply reflecting upon the sacrifice of Christ. No religious dogma: We encourage the freedom of individual belief. A humanist view of life: Our faith is based on celebrating the inherent worth and dignity of every person. Warm, accessible services: Our Sunday services typically include a mix of readings, music, moments of meditation or contemplation, and a sermon. Our children’s religious education program: We teach our kids to be accepting of differing beliefs and the importance of each person seeking his or her own truth. We study the world’s major religions and draw on the core values of each faith tradition. The pastor had just watched the horrific suffering of Jesus and heard him say, “I am the way and the truth and the life. No one comes to the Father except through me.” Hours later he opened an invitation to visit a group where truth doesn’t matter. The contrast was overwhelming. Truth does matter. It matters a great deal what you and I believe. 28 “Be on guard for yourselves and for all the flock, among which the Holy Spirit has made you overseers, to shepherd the church of God which He purchased with His own blood. 29 “I know that after my departure savage wolves will come in among you, not sparing the flock; 30 and from among your own selves men will arise, speaking perverse things, to draw away the disciples after them. · Every Church requires some form of faith confession. § “Having been lead as we believe by the Holy Spirit of God, to receive the Lord Jesus Christ as Savior. o They do not have a foundation for their faith. · Has anyone ever asked why you are a Baptist? · Have you ever stopped to consider why you are a Baptist? I tell people that I am a Christian by birth (being born again) and a Baptist by Choice, discovering a church that believed and practiced what I believe. · Consider for a moment that question. Why are you a Baptist? o How can a Christian convert to a cultic religion? o How can a Church with a strong heritage turn from truth? o How can a pastor or church neglect teaching/preaching Bible? § The people have requested that their ears be tickled. o A Creed (i.e. The Apostle’s Creed) can defend the truth. · How many of you are preachers? o How many of you are called to preach the Gospel? o How many of you are called to declare Christ to others? o So…how many of you are preachers? o As you will see through this series, it is a systematic message. o As you will learn through this series, it is a simple message. o As you will learn through this series it is a salvation message. What is your creed? Could you write it down? You will be able to before this summer is over. 4 I thank my God always, making mention of you in my prayers, 5 because I hear of your love, and of the faith which you have toward the Lord Jesus, and toward all the saints; 6 and I pray that the fellowship of your faith may become effective through the knowledge of every good thing which is in you for Christ’s sake. 7 For I have come to have much joy and comfort in your love, because the hearts of the saints have been refreshed through you, brother. The previous year has been a year of challenges on a variety of fronts, personally and professionally. I am thankful for the support, love, and partnership of the church with me and my family. The church has demonstrated the love of Christ through prayers, generosity, and partnership. That is one of the benefits of being a part of a church family. Sometimes you are the one being a blessing to others, and other times you are the one receiving the blessing. I’m including the piece I wrote for the Wallingford News earlier this year with regard to being a part of a church family to share the reasons why it matters, and to encourage you to invite others to be part of the family here in Wallingford. Wednesday Night Prayer via SKYPE. I pray that the fellowship of your faith may become effective through the knowledge of every good thing which is in you for Christ’s sake. Why does being a part of a church family make a difference? I love the church. It’s the center of my life and has been since childhood. I grew up in the church. Every time the doors were open I was there. It’s the place where I was led to the knowledge of God, where I learned about the life and death of Jesus Christ, and where I gained the knowledge of salvation and eternal life through faith. It’s where I learned how to pray, how to sing, how to worship, how to love, and how to serve. It is where as a young man I experienced the leading of the Spirit of God directing me to a life of ministry. I met my wife through youth activities in church. We raised our children in the church, and now our grandchildren, too. The church touches every part of my life—in fact you could say it is my life. A family to belong to. Help in times of need. Knowledge of life and eternity. People spend so much time and effort finding reasons and excuses for not being part of a church family. If only they could invest a portion of that energy in looking for a church to connect with in their life, I am convinced that they would find a place to belong and a mission in which they could participate. Perhaps First Baptist Church of Wallingford is not the church they would choose. Believe it or not, that is not my purpose. My goal is that people would find a place where they can connect with God and with other believers. On the other hand, perhaps FBCW is exactly that church for you. You will never know until you step out and try. Find the church in your area where you can connect, and commit to attending for a period of time, at least one or two months consistently. I know you will locate a family of God where you will be welcome and where you can connect and serve the living God. A post this morning from my friend Terry Dorsett drew me into Psalm 46. I realized that I have been throwing a little pity party lately because of the physical and financial struggles that my wife and I have been facing. Looking at our struggles so closely has moved my focus from the “very present help in trouble” to just the trouble. The financial hardship has been significant. The physical struggles, especially for my beloved, have been difficult. The troubles we face are large. However, God is able to work wonders, even in the midst of the troubles. He has seen us through and has provided what is needed at the moment it is needed. He has proven time and time again that He is my refuge and strength, and my very present help in trouble. Wait….look at that verse again. Did you catch that little word slipped into the message of that verse? It states that God s “a very present help…IN…trouble.” Now, I would much rather that God were “the present help keeping me out of trouble,” but His word assures me that, though I face hardship, He is there with me IN the difficulty. The message for me, in the midst of all my worry, is that God is PRESENT and IN the midst of my life’s trouble. I do not need to fear, worry, or panic. What I need is to trust and rest in the One who is my REFUGE and STRENGTH. Pray for me, and I will pray for you as well. Jerry Falwell declared that “Nothing of eternal significance occurs separate from prayer.” Because of this truth, believers must make prayer a priority. This video offers and invitation and challenge that can transform your life and welcome in spiritual awakening.